As a longtime bachelor, I make a point of eating a balanced diet from the three bachelor foodgroups: cheeseburgers, pizza, and tacos. A balanced diet means alternating food groups so that one is not consumed twice in a row (except for leftover pizza, which everyone does). Nonetheless, over the past several decades I have become aware that vegetables can serve a bigger purpose in the human diet than just as pizza toppings. If I want to live a long time and be healthy, I need to eat my veggies. In terms of veggies that will make a nutritionist salute and then do a double back flip, it’s hard to beat broccoli. The problem is that I seldom cook, and fast food joints seldom serve broccoli. Where does this bachelor solve his culinary challenges? 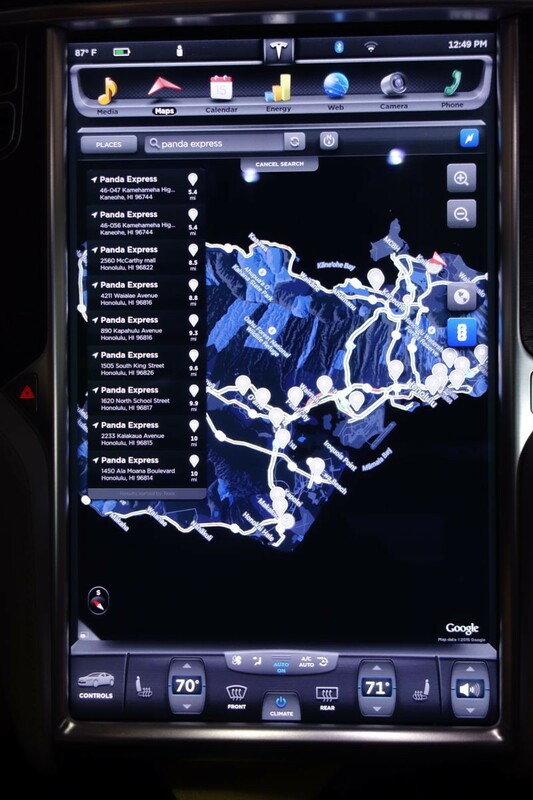 On the navigation page of the Tesla’s 17″ display, of course. To find bachelor broccoli, you need to use magic words. I have found that for me, the words “Panda Express” work great to bring up a source of nutritious broccoli for me and beef for Iceman when entered into the Tesla’s Navigation program. Enter the magic words, and this feature of the Tesla shows me over a dozen nearby locations for solving my nutritional challenges. This entry was posted in Tesla Discoveries and tagged eating a balanced diet. Bookmark the permalink. As this is the beginning of a healing and rejuvenating adventure, we share food for thought on both subjects (healing, food). The average American restaurant serves food cooked in aluminum, meats full of antibiotics and growth hormones (promotes accelerated weight gain), fruit and vegetables full of numerous pesticides and some genetically modified (alters gut bacteria). For example: I looked up the Costco green beans = 52 pesticides. On top of that, if its not organic it is grown in nutrient depleted soil so critical minerals are missing – the majority of America is mineral deficient and suffering imbalance. It’s documented that up to 80% of your “feel good” chemicals are manufactured in your gut, not your brain (like Serotonin). Loving your gut by providing it with free range meats and nutritious organically grown fruits and vegetables prepared with heart and in safe cookware will go a long way to making this a lifetime investment. You are already a remarkable person, a diet rich in nutrient dense food will propel you to a new realm on every level. My only fear is you will come back and hold our bad choices to the fire. Be well, Inspire us all. There are plenty of links to organic, local food sources across the country. here’s one. http://www.eatwellguide.org/. If you find more, please share. Yep, looks like pizza, cheeseburgers, and tacos just won’t cut it. Thanks for the suggestions and we’ll look at other magic words to use as the trip progresses. You’re absolutely right that a goal of this trip is renewal and health. Eating right is an essential ingredient. Then we shall expectantly await your discoveries on tips to hone our own eating habits here at home. All shall be useful, except possibly the course on how to catch and skin your own bison. blog on my iphone during lunch break. I love the information you provide here and can’t wait to take a look when I get home.